Spinach is good. 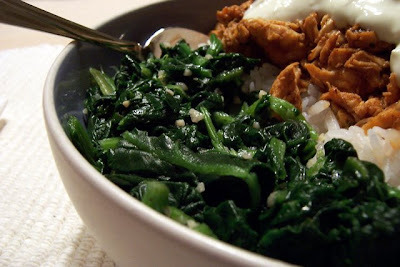 Spinach is good for you. Spinach is high in iron, calcium, folic acid, vitamins A, C, E, K, and if there was a vitamin S, well, it would be in there too. 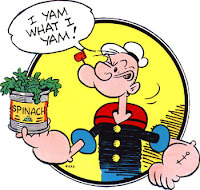 Spinach in large quantities will give you forearms like this guy. Okay, not really on the last one. Well, that's all the good stuff about spinach. Yup, it's the "wonder veggie" alright.... right up to the point where you realize spinach has a natural adhesive quality in stress-related situations. Been there? Who hasn't. 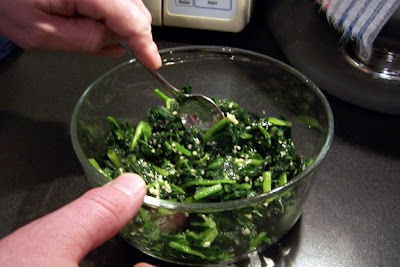 And that's not the only problem: steamed spinach doesn't have much in the way of flavor. There, I said it. So, how to solve the sticking problem AND give make it bit more enjoyable? Give this quick and easy recipe a try. ** use pure olive oil to cook with, and save your fruity "EVOO" for salads (sorry Rachael, it can't handle the heat, and the flavor can overpower a dish). 1. 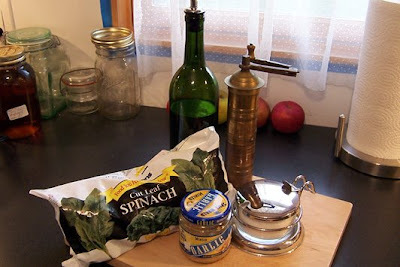 Place the frozen spinach in 2-quart microwave-safe bowl, cover and nuke on high for one (1) minute. 2. After one minute, remove from the microwave. 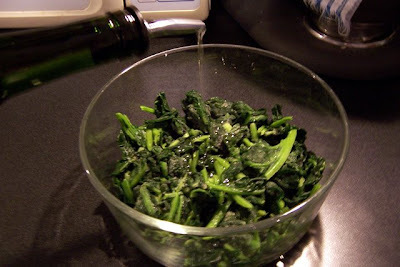 The spinach won't be completely thawed. Drizzle with the olive oil, season with the salt and pepper. 3. Add the garlic (oh yeah!). 4. Stir, stir, stir. Cover, return to the microwave, and nuke on high for 1-1/2 minutes. Serving Suggestion: Well gee, you can serve this side with pretty much any entree. 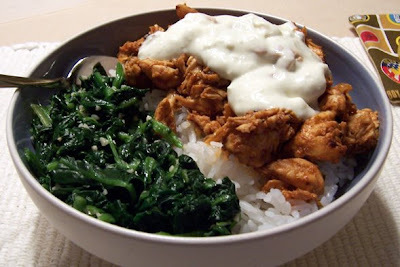 This time we chose to sit it along side our East Buffalo Chicken (coming soon to a food blog near you). 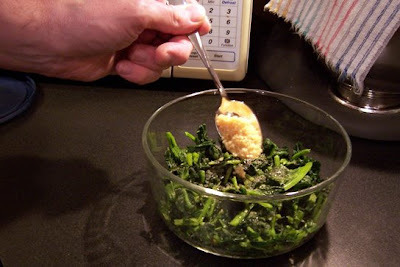 Feel free to season your spinach any way you wish. Personally, I had a hard time keeping the parmesan off it this time... didn't want it to conflict with the bleu cheese.